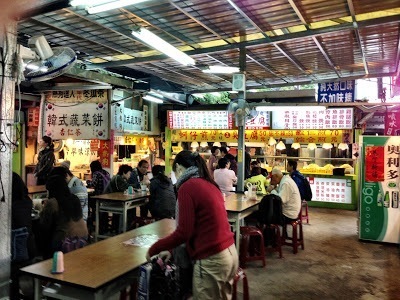 Taiwan is renowned for its food. 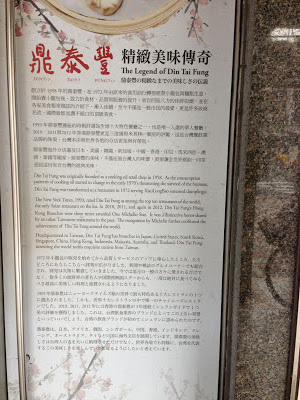 I didn’t actually know this until I started reading up on Taiwan for this trip. 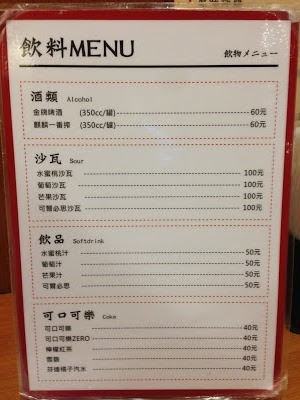 This is not surprising, as I really knew very little about Taiwan. It was the first thing I learned when I started researching though. And I was very excited! 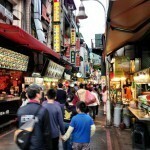 Eating in Taipei is fabulous, especially at the night markets. I am far from a food connoisseur and definitely not a food critic, so don’t expect anything fancy from this post. 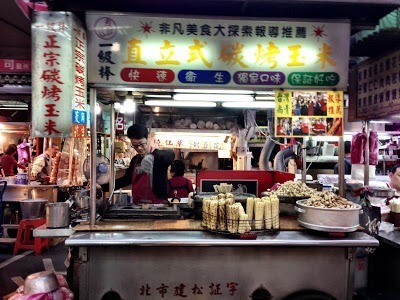 I do love good food though and a blog about travelling in Taiwan would not be complete without a food post. This is our experiences, dining as an English speaking family in Taipei who don’t know any Chinese. I point this out as there is a big language barrier and it gets in the way of us being able to enjoy the full Taiwanese culinary experience. 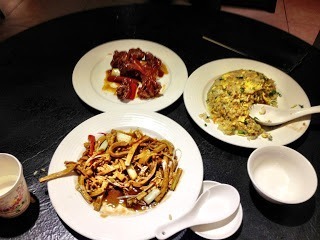 Thankfully, even with no Chinese (and therefore no idea what you are ordering most of the time), you are still going to get very very awesome food. It is all very good value. At most, we only paid what we would pay at a cheap restaurant at home. S and Z proved how they are not fussy eaters at all, and they are enjoying the food as much as we are. Breakfast time meant some weetbix for the kids and then some yummy surprises (surprises as we dont know exactly what things are) from one of the “Bread Top” style stores near our apartment. A very yummy way to start the day. 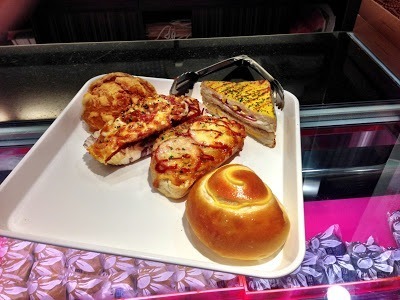 Many shopping centers have awesome food courts. 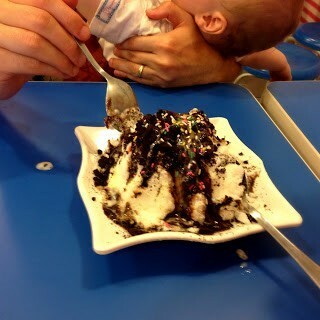 The ones we went to were not like food courts at home at all. The surroundings are pleasant, the amount of food on offer is astounding, and the food is not like tasteless plastic at all. The food we ordered was superb. Soooooo good! Kind of like a noodle pizza. 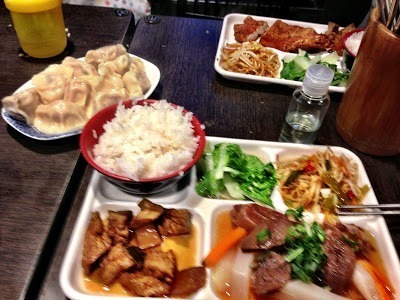 There is a yum cha place near out apartment that was so good that we had to go back. It is called Kao Chi and is on Yongkang St.
We had a pork and tofu dish that I thought was maybe the best Chinese thing I had ever had. That was until the next visit when I had their sweet and sour chicken… I had no idea sweet and sour chicken could taste so good. That was probably the best chicken dish I have ever had. The only problem? 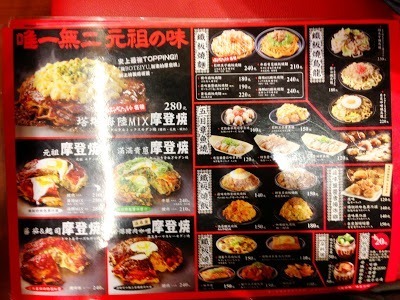 That I couldn’t eat more, so I could try more dishes. Read more about it here. 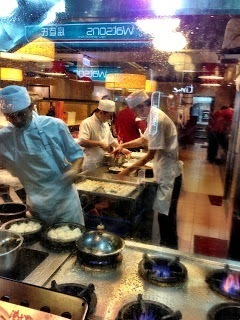 Very close to our apartment was the famous, Din Tai Fung restaurant. It made a top ten list of the best restaurants in the world in the New York Times, and it is very very popular. We saw lines here just about always, even first thing on a Sunday. “The staff spoke very good English. I got an english menu, and there were patronising yet helpful suggestions on how to order and how to mix the soy and vinegar with ginger. I ordered some Pork Xiao Long Bao, a couple of Pork Buns and some noodles in special chilli sauce. “The other people at the table were tourists too I think. Otherwise there were people on their lunch break, families and groups of students. “The food was nice fresh and very tasty. Wait times were small. It was good, but I would not say that it’s one of the ten best restaurants in the world.” Read more here. If nothing else is around, you may be able to find a hawker style set up like we have found in other Asian countries. This was at the top of the Maokong Gondola. The food was simple, but filling and good and very cheap. 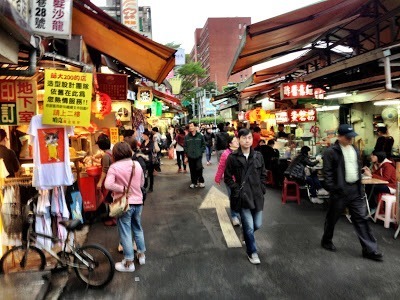 There are quite a few night markets in Taipei that are well known for having lots of delicious food. We made it to the better known ones. What they had in common is that they all had great atmospheres and yummy food with many choices. This is written in the order we visited them. 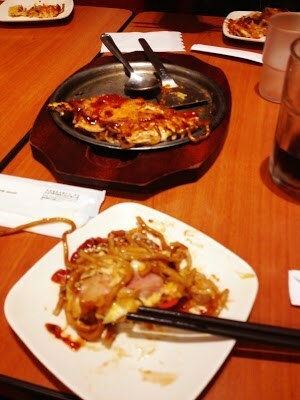 We became more adventurous the more we got used to ordering food without having any idea what we were ordering. Most items were around AUD$1. 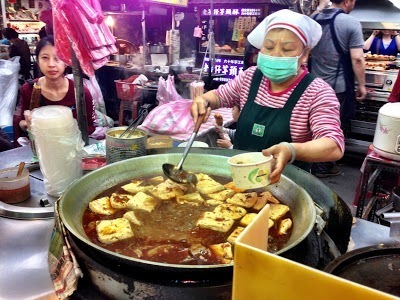 We loved eating in Taipei’s night markets. One thing that did surprise us is that we expected there to be more seating room (there is barely any). This night market is walking distance from our apartment, so we tried it first. It is a reasonable size, but for some reason I did expect it to be bigger. 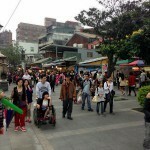 There are a lot of shops mixed in with the food stalls, especially clothing stores. It was full of people by 6pm. There wasn’t much english and most places didn’t have pictures which made it trickey, but there were plenty of places that we felt we could dine at and have some idea what we were ordering. We ended up at a restaurant where we could sit upstairs and watch everyone walking by below us. It was great and we had a good meal. More information here. 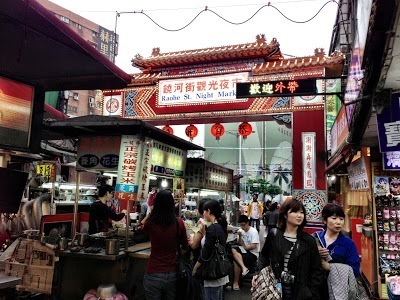 Raohe night market is Taipei’s oldest. I have heard many people say it’s also the best, and we agree. 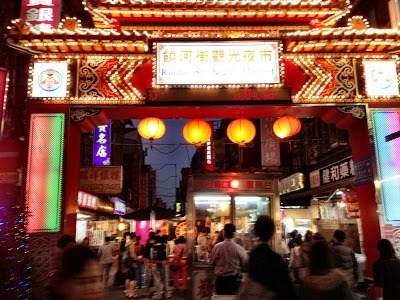 It is one big long street, packed full of little stores. 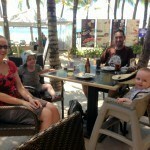 It seemed to have a lot more than Shida, and I’m not exactly sure why, but we felt more comfortable here. We got more into the swing of it and ordered lots of different bits and pieces from lots of different stalls. This was great and I urge you to do the same. If you don’t like it, it doesnt matter. It’s all cheap, and I’m sure the next thing you buy will be a winner. S especially loved this market and kept asking for more food. My favourite foods were strangely some corn, which was just delicious and not like how I’ve ever had it before, and it’s hard to go past an oreo and condensed milk snowflake ice (on the topic of oreos, we also saw deep fried oreos :-/). We caught the MRT to Haushanpi and from here its about a 15 minute walk. We caught a taxi back which was TW$210 (just under AUD$7) to our apartment near YongKang St and took about 25 minutes. We arrived at the market at about 5:15pm which was a bit early so most of the stalls were still setting up. 6pm would be a better time. More information here. We saved the biggest and the most famous night market to last. Shilin night market is meant to be the grand daddy of all night markets and also the most touristy, not that it seemed touristy to us. 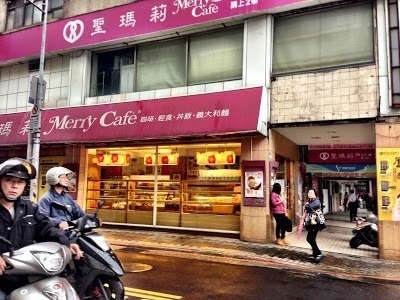 It is the ultimate place for eating in Taipei. 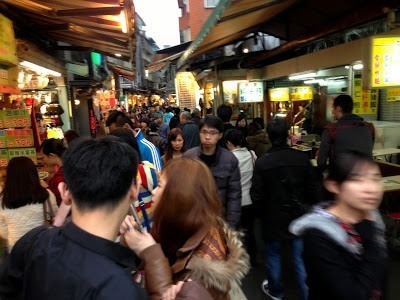 Unfortunately, our great experiences at night markets did not continue here. It was big, but mostly it was shops selling clothes and other things and not food. It took us ages to even find any food. 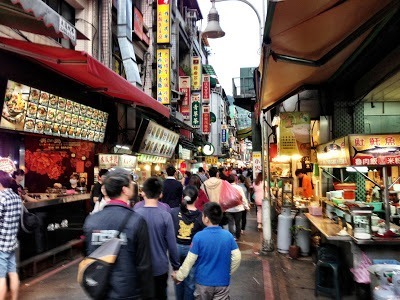 There seemed to be less on offer than at Raohe – it was very spread out at Shilin though, so this may not be true and it might have just seemed that way. The crowds, all the walking before we got food and worst of all, the fact that there was motorbikes and scooters zooming along the market stalls fast, ruined the experience, and we did not enjoy this market very much. The motorbikes and scooters were just ridiculous. It was so dangerous, and it made it very hard for us to relax as we had left the stroller at the apartment, and I kept having to worry about S getting run over! On the upside, we did have some good food. It just wasn’t as good as at Raohe and the other things ruined it a bit. wow shall i have frogs’ eggs or a deadbeat chook?! 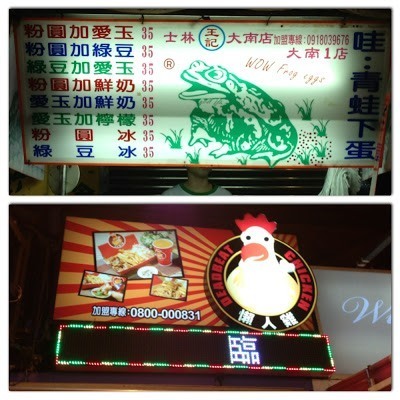 It is basically across the road from Jiantan MRT station. More information here. 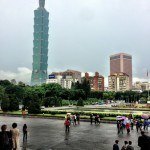 Click here to download a complete list of 25 other things you can do in Taipei while you are there! So is your mouth watering yet?! 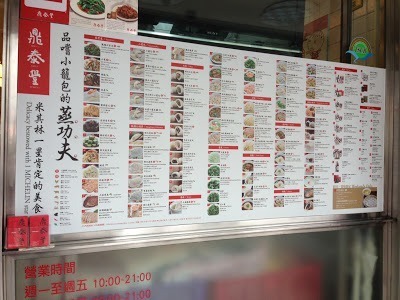 Eating in Taipei is just amazing. You can also read about other things to do in Taipei and our couple of days in Dansui, as well as our overall thought of Taiwan. Nope, no pepper buns but now I want one!! I am not even sure what we ate where as we would just point at things that looked good. 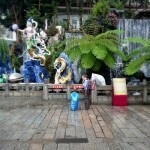 I thought we must have missed something in Shilin!